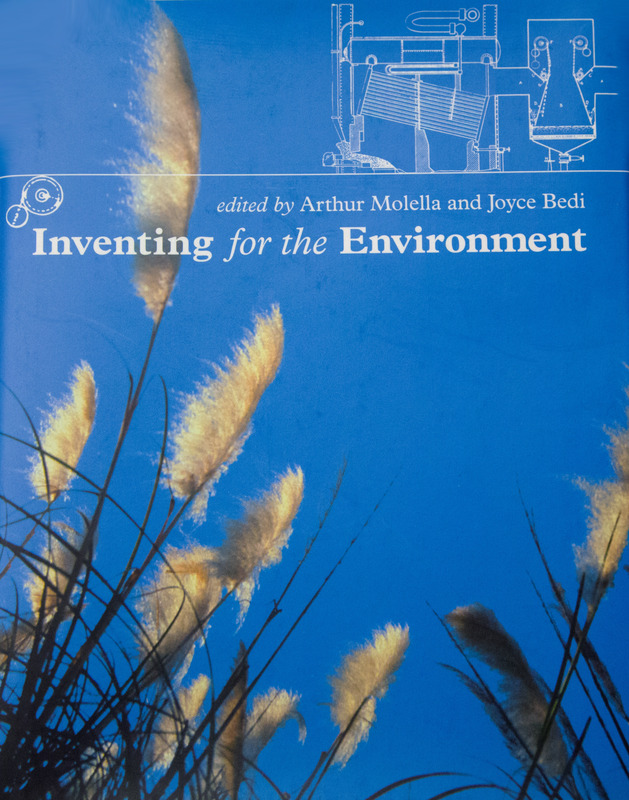 The jacket art for Inventing for the Environment was designed by Sharon Deacon Warne. starts with nature itself and then leads readers to examine the built environment and then specific technologies in areas such as public health and energy. Each part focuses on a single environmental issue. Topics range widely, from the role of innovation in urban landscapes to the relationship among technological innovation, public health, and the environment. Each part features an essay by a historian, an essay by a practitioner, and a "portrait of innovation" describing an individual whose work has made a difference. The mixture of historians and practitioners is critical because statements about the environment inevitably measure present and future conditions against those of the past. Early in the industrial revolution, smoke stacks were symbols of prosperity; at its end they were regarded as signs of pollution. Historical examples can also lead to the rediscovery of an old technology, as in the revival of straw bale construction. As it explores the history of invention for the environment, the book suggests many new ways to put the past to use for the common good. Arthur P. Molella is Jerome and Dorothy Lemelson Director of the Smithsonian Institution¹s Jerome and Dorothy Lemelson Center for the Study of Invention and Innovation. Joyce Bedi is Senior Historian at the Smithsonian Institution's Jerome and Dorothy Lemelson Center for the Study of Invention and Innovation.